10 day, 9 nights, $3995 U.S.
A Bicycle tour unique in scope and adventure!! 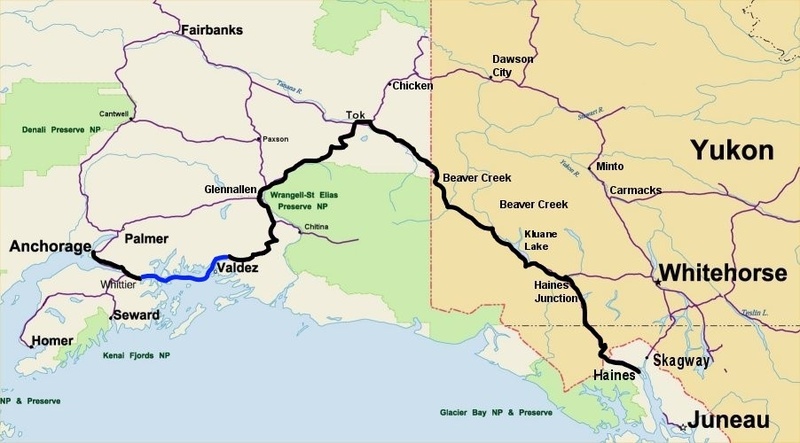 Our ALCAN Highway Expedition is a 10-day tour from Haines to Anchorage, a distance of 700 miles over some of the most remote paved highways in the world. The Alaska Highway was built in a crash program by the U.S. Army in 1942, and while the road has been upgraded many times since, the wilderness around the road is virtually untouched. We average 65 miles per day over a 9-day stretch, and for those who are interested, bonus miles are available! Haines is the Bald Eagle capital of the world, and while the concentration of eagles is highest in the winter, there are still lots around when we visit. We take an afternoon bicycle ride out Goose Bay Road to Chilkat State Park to see the eagles, then spend the night at the historic Hotel Halsingland. A hop in the van takes us through Canadian Customs up to Chilkat Pass where we mount our bikes for a spectacular ride down the Haines Highway to Haines Junction. The entire day is spent amidst the mountains of the Coast Range, as we pass from the maritime climate zone to the much warmer and dryer Yukon Interior. While we start the day at the high point, and end it at the lowest, along the way we encounter the 'Hills of Significance.' While these hills are guaranteed to get your attention, don't panic! They are the steepest on the tour! Standard mileage is 75 with a century day option available. From Haines Junction, we turn onto the ALCAN Highway and head up toward the Shakwak Valley. On our left loom the St. Elias Mountains, the highest of which, Mt. Logan (19,500 feet), is the highest mountain in Canada. We spend the night at Destruction Bay on the banks of Kluane Lake. Kluane Lake is the largest lake in the Yukon, and its turquoise blue waters and spectacular mountain surroundings make it one of the most beautiful spots in the world. We cycle along the Alaska Highway along the Shakwak Valley. The Shakwak Valley was created by the Denali Fault, one of the major fault lines of North America. The road follows a series of long narrow valleys through the wilderness. The St. Elias Mountains are continuously on our left as the road crosses several of the largest rivers in the Yukon Territory. A recent highway project has brought most of the highway up to modern standards, while the surrounding areas are unpopulated and pristine. It’s an unbelievable bicycling experience! Mileage: Day 5, 56 miles / Day 6, 59 miles. Twenty miles into day seven we reach the U.S. Border, and once again we are in Alaska. The St. Elias Mountains have blended into the Wrangell Mountains, the largest volcanoes in North America. We will be tracing a great semi-circle around the Wrangells for the next three days. Immediately below us on the left, the Chisana and Nebesna Rivers merge to form the Tanana River, the largest tributary of the Yukon River. The road parallels the Tanana River as we curve behind the Alaska Range to the northernmost point on our tour, the small town of Tok. Standard mileage is 75, with a century day option. Days 7 and 8: We head south on the Tok-cutoff into the Alaska Range. The Alaska Range is geologically very young with steep mountains stained with vast mineral fields. We pass through the range at Mentastna Pass, only 2,400 feet and drop into the Copper River Valley. Directly in front of us, across the valley loom the Wrangell Mountains, with Mount Sanford at 16,237 feet dominating the incredible view. The road bends to the right and crosses a vast tableland with the Wrangell Mountains on our left, and the Alaska Range on our right. Spectacular! We eat dinner at the historic Gakona Lodge (est. 1906). Standard mileages are 50 and 75 with a century day option on both! We wind our way up the Tsaina River, toward Thompson Pass. On the way, we stop off at Worthington Glacier, only yards from the road! Thompson Pass is only 2,678 feet, but far above treeline, and the views from here are truly spectacular. Don't forget your camera! We now drop 2,500 feet in six miles into the Lowe River Valley. Following the Lowe River, we ride through the vertical rock walls and numerous waterfalls of Keystone Canyon. We spend the night in Valdez, the port for the Alaska State Ferry, and across the bay from the Trans - Alaska Pipeline Terminal. Total distance 56 miles. We wake up early and board one of the ships of the Alaska Marine Highway for an unforgettable trip across Prince William Sound. Whales, sea lions, seals, eagles, and otters populate the sound in large numbers, and the ship makes a side trip near the face of the enormous Columbia Glacier. We leave the ship in Whittier, and board a shuttle for a 15-minute ride UNDER the Chugach Mountains to the Portage Glacier. 10 Days, 9 Nights $3995 U.S.